So good, even the carnivores will love it! If using dry, uncooked chickpeas, soak them in a large bowl filled with water, at least 8 hours or overnight. Drain and rinse the chickpeas and place in a medium-sized pot with 750ml (3 cups) fresh water. Cover with a lid and bring to a boil. Add a pinch of salt, cover again and simmer over low-medium heat, about 50 minutes, watching carefully after about 35 – 40 minutes. When cooked, the chickpeas will be tender and some may have split open. Drain and rinse. Preheat the oven to 150°C. Mash the steamed or boiled potatoes and set aside. Place the sunflower and sesame seeds in a baking tray and toast in the oven until lightly golden in colour, about 12 minutes. Set aside. Combine the garlic with all of the chopped vegetables and the parsley, stir in half of the salt and set aside. Mash the chickpeas and rice very well with a potato masher, leaving some chunks for texture. You can also pulse them in a food processor. Preheat a large skillet over medium-high heat. With a wooden spoon, stir the chopped vegetables into the mashed chickpea/rice mixture. Add the potatoes, then stir in the seeds, breadcrumbs and ground flax. Add the remaining salt and the red pepper flakes to taste. Shape 4 – 8 patties from the mixture, packing the dough together tightly. Spray or brush your preheated skillet with a little oil and cook the patties until browned and firm, 4 – 5 minutes each side (time will vary based on your temperature). 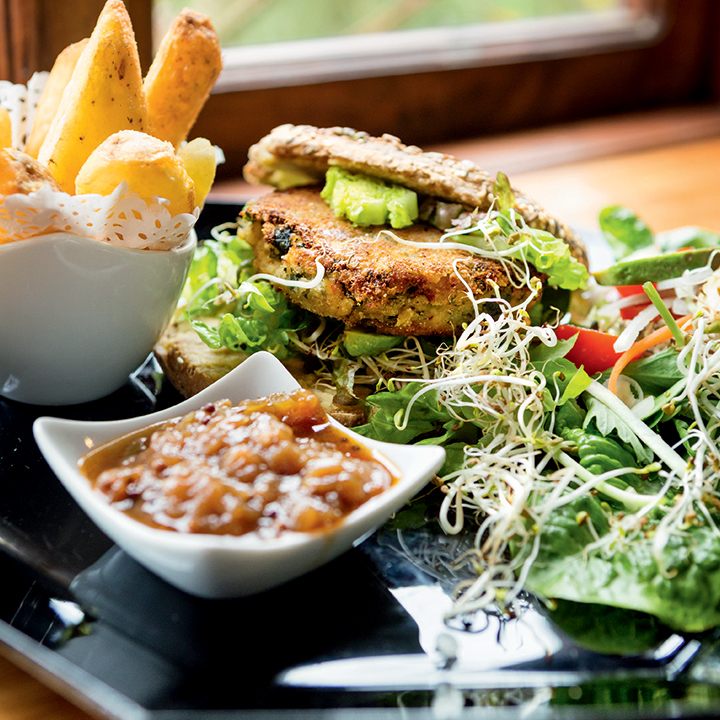 Serve the patties in vegan rolls with a side of salad, potato wedges and red onion chutney. You can also try grilling the patties: pre-bake them at 180°C for 15 minutes, before grilling to brown.